The time has finally arrived. 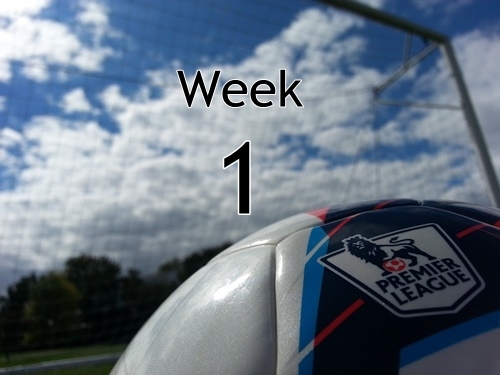 The start of the 2014-15 Premier League season! I am totally ready and so excited to get started. Having had a summer of nearly nonstop soccer action has actually seemed to help me be even more excited for this EPL season to start up again. The debate will rage on as to which league is the best, but the Premier League is the one that I prefer, and have the most access to. As always I will continue to put out my predictions for each match starting with this first weekend of matches. I enjoy being able to make my picks and I do try to take into account a team’s recent form as well as various statistics. In the past I have done match previews, but due to time constraints I am not able to get this done for every match of the weekend. Occasionally I will be able to put out some previews, but for the most part will need to stick to the weekly predictions format. Here are this week’s predictions and picks for the start of the Premier League season. I feel quite confident in predicting strong starts for Arsenal, Chelsea, Liverpool, Manchester City, and Tottenham Hotspur. Manchester United has looked strong in pre-season and a winning start is predicted, but Swansea could just as easily provide a strong barrier for this. The rest of the league still has a lot of question marks. Everton look like they are again going to mount a challenge, but they will be travelling to Leicester who will not make it easy for them. Elsewhere, Stoke West Brom, and QPR will be hoping that their home field will provide an advantage, but will not have easy opponents. There are a few teams that have the ability to score at least two or more goals, but it seems that so often the Premier League season starts out with low scoring matches before picking back up again after a few weeks. I guess we will see what this weekend brings. As always I will try to do my best to keep the television updated for Premier League fans watching matches in the U.S. as well as updating the Premier League table weekly. Enjoy!